Everyone needs a really good chocolate buttercream recipe. I’ve made chocolate frosting in the past, by simply adding some cocoa into my american buttercream recipe. It was good, but I wanted more chocolate!! I wanted to be smacked with chocolate flavor the second I tasted this frosting. So I modified the recipe to add in a lot more cocoa, and some melted chocolate. This is now my go-to chocolate buttercream recipe. It’s still super easy to make, but has that fudgy taste, and creamy texture that makes it irresistible. This chocolate buttercream recipe has an american buttercream base, so it is super easy to make. I bet you already have all the ingredients in your pantry!! It comes together in less than 10 minutes, and tastes amazing on pretty much anything. I used this frosting on my Baileys Chocolate Cake, my moist chocolate cupcakes, and with my marbled cake recipe. It never ceases to amaze me. One batch of buttercream will fill and cover a small layer cake (six or seven inches). 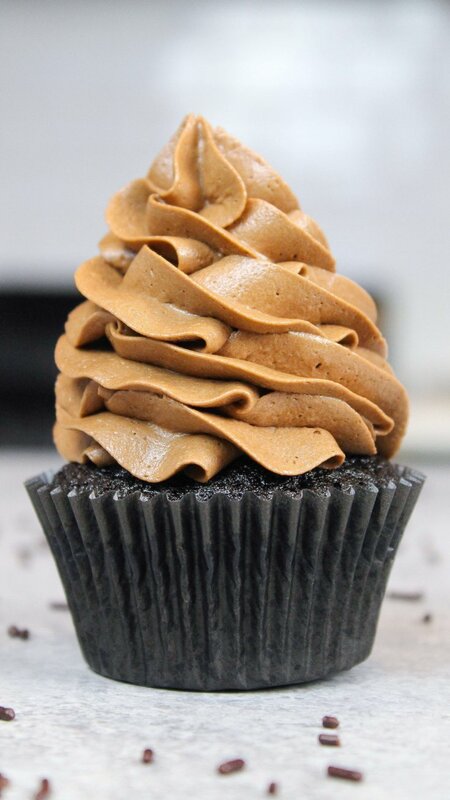 Or if you plan to decorate cupcakes, a batch of this chocolate buttercream will frost about 3 dozen cupcakes. This can vary based on how much frosting you add between your cake layers, or how large of swirls you pipe onto your cupcakes! But that is my general guidance around the yield of this recipe. It makes about 9 cups of frosting. 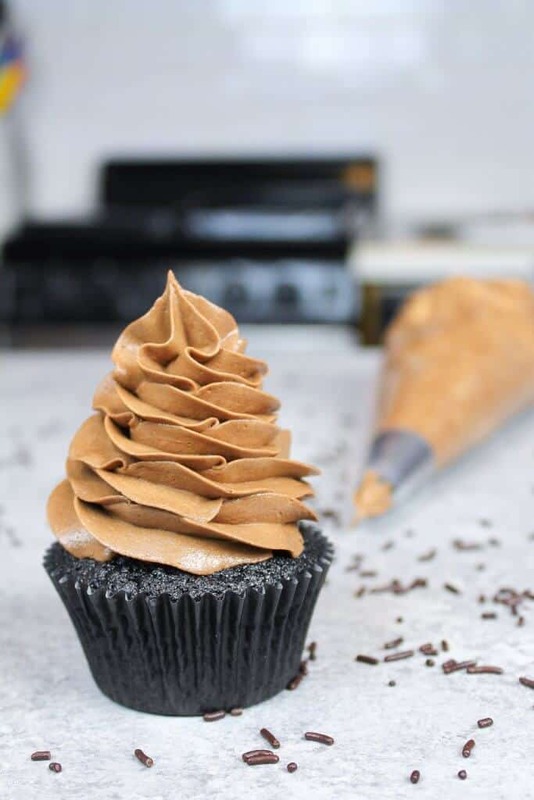 This chocolate buttercream can be made in advance!! I highly recommend making it ahead of time. It makes the decoration of a cake or cupcakes less stressful, and a lot more fun. This frosting keeps in the fridge for several weeks, if stored in an airtight container. When you’re ready to use the chilled buttercream, remove it from the fridge a few hours in advance (or overnight) and allow it to come to room temperature. Give it a good stir with a rubber spatula or your kitchen aid, to get rid of any air bubbles that may have formed. Once the buttercream is smooth again, it’s ready to use! If you try recipe, please tag me @chelsweets, and use the #chelsweets, so I can see your beautiful creations!! 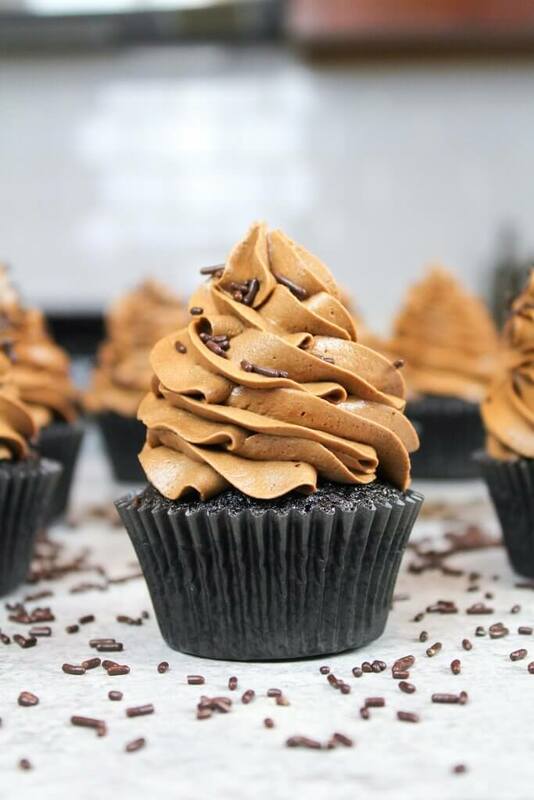 Learn how to make my favorite chocolate buttercream. It uses both cocoa powder and melted chocolate, to give it a fudgy chocolate flavor!! It comes together in less than 10 minutes, and is my go-to chocolate frosting recipe. This recipe works great for piping on cupcakes, and frosting cakes! Beat the butter on a medium speed for 30 seconds with a paddle attachment, until smooth. Add in the sifted cocoa, and mix on low until the cocoa is fully incorporated, and no clumps remain. Slowly add in the powdered sugar, 1 cup at a time. Alternate with small splashes of cream. Mix in the cooled, melted chocolate. Once fully mixed, add in the salt. Beat on low until the ingredients are fully incorporated, and the desired consistency is reached. If the frosting is too thick, add an extra Tbsp of heavy cream. If it's too thin, add in another 1/2 cup of powdered sugar. 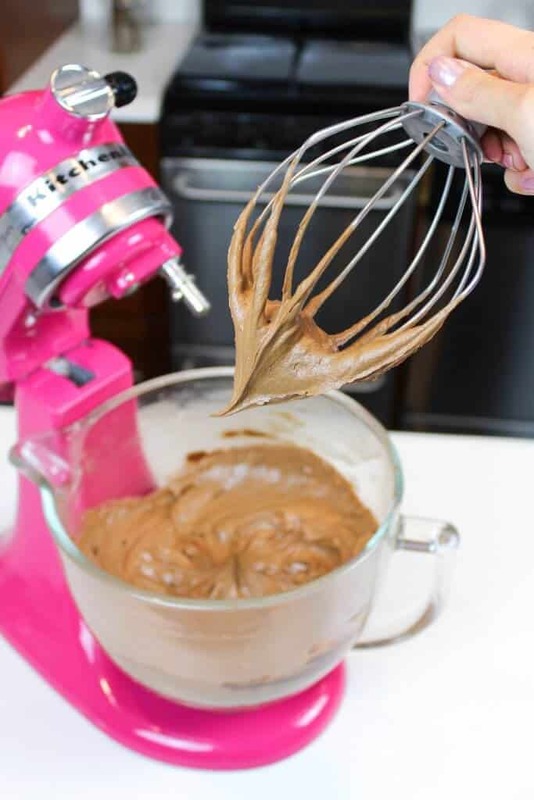 Stir by hand with a rubber spatula to get the frosting SUPER smooth. Use as desired to pipe or frost on cupcakes and cake. One batch of buttercream will fill and cover a small layer cake (six or seven inches), and will frost about 4 dozen cupcakes. This buttercream can be made in advance!! I highly recommend making it ahead of time to make the decoration of a cake less stressful and more fun. It keeps in the fridge for several weeks, if stored in an airtight container. When you're ready to use the chilled buttercream, remove it from the fridge a few hours in advance (or overnight) and allow it to come to room temperature. Give it a good stir with a rubber spatula or your kitchen aid, to get rid of any air bubbles that may have formed. Once the buttercream is smooth again, it's ready to use! This buttercream looks delicious Chelsey! 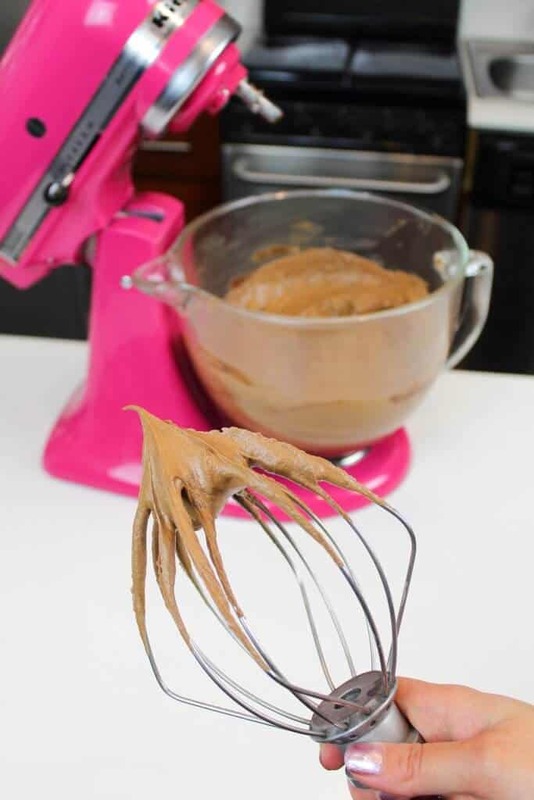 I note that your instructions say to use a paddle attachment to make buttercream yet your picture above shows the whisk attachment. Which attachment do you prefer? I have had issues in the past where my buttercream has developed too many air pockets making it difficult to get that smooth frosting finish. This has happened mostly when I have colored my frosting a vibrant color. I use Americolor but I guess in the quest to achieve the perfect color shade, I over mixed it. In any event, I am just trying to perfect my technique for smooth air pocket free buttercream and since your photo shows a whisk I wondered if I should use that rather than the paddle? I was going to ask the same question about using the whisk attachment! On her YT video she mentioned using the whisk if you’re using it for cupcake and using the paddle attachment if it for a cake! What brand or kind of dark chocolate and cocoa powder do you use??? I wanna make this tonight! ?? This recipe is genius! I too am not a fan of fondant, and I am trying to up my buttercream game. This is going to be the new favorite, I think. ? Can you use milk chocolate instead of dark chocolate? Chelsea, what kind/brand of chocolate do you recommend for melting?